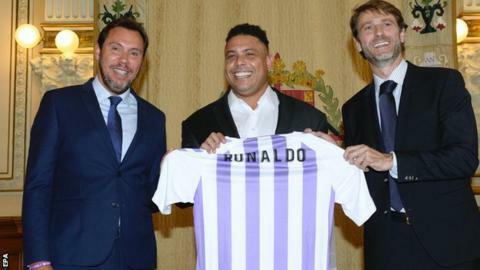 "He doesn't want to just throw money at it," said Guillem Balague of Brazilian great Ronaldo's takeover at Real Valladolid. "He's not a rich daddy that way." The World Cup winner, three times voted Fifa's World Player of the Year, took a major step into club ownership by buying a 51% stake in La Liga minnows Valladolid for 30m euros (£27m) on 3 September. On the surface, it might seem an odd move - his new club have just been promoted to La Liga, have little money and are widely expected to struggle to stay up. Yet according to Spanish football expert Balague and his colleagues on BBC Radio 5 live's Euro Leagues Podcast, the move might just prove a masterstroke. Ronaldo had a good working knowledge of Real Valladolid before buying his majority stake - as he co-owns a wine business with Jose Moro, who was the club's vice-president until June. Balague said: "The reason Ronaldo's done it at Valladolid is that he knows the area. He feels there is a lot of potential at this club. It's one of the historical clubs of La Liga. In the all-time table of La Liga, they are 13th." But history, potential and the advantages of local knowledge are not the only reasons for wanting to buy the club, according to Balague - who believes that taking charge will help Ronaldo with his long-term ambition to be the head of Brazilian football. "He says he's not going away on holiday, having bought the club," Balague said. "He wants to be involved hands-on. "He wants to be the president of the Brazil federation, so it will be a good experience for him to do what he's doing at Valladolid." Has Ronaldo got the right business sense? The Brazil great was renowned for his skill on the pitch, but has also enjoyed off-field success, having invested in a sports marketing company as well as co-owning the wine business with Moro. According to Euro Leagues Podcast presenter Mina Rzouki, Ronaldo's great strength lies not in business acumen, but in getting the right people around him. She said: "He's done very well to say that he will keep the president in place, that he will just watch what's happening and slowly try to improve the club in the best way that he can. "Obviously, the club's debt will go, or has already gone, and he will work slowly with the people who are advising him to try to make the most of it. "He's aware of his limitations, and aware that he needs to delegate. I think that's what makes him a smart man." The purchase of a majority stake in Real Valladolid is well-timed, given La Liga is on an aggressive marketing drive to increase its earning potential, according to BBC European football expert Steve Crossman. La Liga has signed a contract to play one game per season in the USA for the next 15 years, and Ronaldo's presence at Valladolid now makes them a very attractive prospect, Crossman argues. "I actually think, as a decision, it's a no-brainer," he said. "It's certainly a good time to be in charge of a Spanish club, because the money from TV rights is only going to go in one direction. "On top of that, you've got the new North American link-up. If you're Valladolid, that is a massive money-spinner for you. The opportunity to grow the club is huge now. "If you're in North America, Valladolid are now towards the top of the list of the clubs you'd want because of Ronaldo's involvement." So will Valladolid now become big-hitters? According to Balague, Valladolid are operating with La Liga's smallest budget this season. Their squad is short on international household names, and the club are expected to spend heavily in January now that Ronaldo has control. However, Balague argues that the former Brazil striker will not chuck money at the club - and that in any case, the players already there will want to prove they are worth a chance under the new regime. "Now that Ronaldo is in, everybody expects more money coming in for signings in January, but remember, he's a businessman. He's here to make sure that the team improves and he's talking about that, but organically."